Following last year’s relative tranquility, global equity market volatility picked up during the first quarter of 2018. 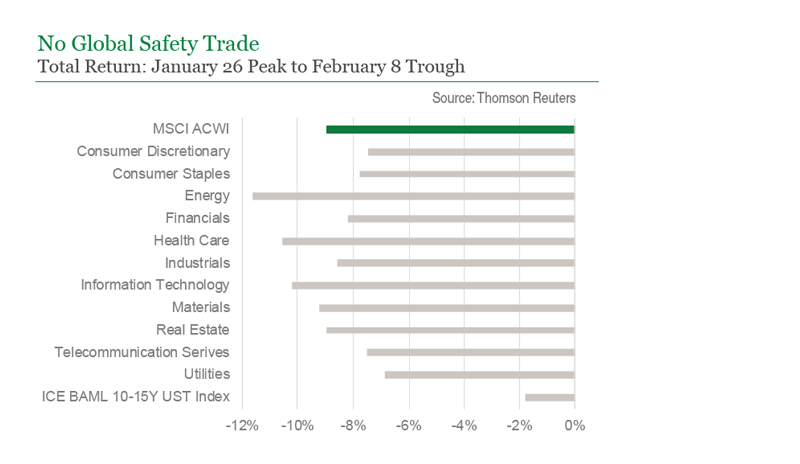 Market gyrations first materialized in early February, driven by an increase in reported wages for US workers that came in well above consensus expectations. Investors feared that rising inflationary pressures would prompt the Fed and other central banks to tighten policy at a quicker pace than discounted by markets. Risk assets sold off broadly, and even the more defensive areas of the market failed to provide protection. We viewed the market reaction as overblown. The wage number was inflated due to weather-related distortions: 496,000 primarily low-paid workers were unable to work because of an unseasonably cold January, and their absence from the wage sample artificially boosted average hourly earnings. Indeed, February wage data confirmed this view as the distortion was completely unwound. Volatility resurfaced toward the end of the quarter amid concerns surrounding trade protectionism as well as developments within the US tech space that spilled over into international markets. Our perspective on trade, in short, is that an increasingly protectionist trade policy is a key potential downside risk to economic growth. Regarding developments within US technology, we continue to assess whether sentiment-driven market volatility leads to material knock-on effects by closely monitoring regulatory risk, user defection data, consumer sentiment toward tech companies, and US anti-trust law. Considering the data thus far, we remain positive on how we are positioned in tech. In all, first quarter market gyrations underline the notion that the economy does not equal the stock market. While economic activity has picked up and nominal global growth continues to move higher, the improved state of the global economy was not enough to counterbalance the aforementioned investor concerns. This led to global equities experiencing their first quarterly decline since the third quarter of 2015 on a USD total return basis. With valuations stretched relative to history and global central banks gradually removing emergency monetary accommodation, volatility is likely to persist and investors should look back at 2017 market tranquility as an anomaly. Going forward, it is highly unlikely that we will experience the same “rising tide lifts all boats” market environment that has generally persisted, and as a result, sector and security selection will play a critical role in managing risk. Growing indications of “peak” soft data: PMIs, business and consumer sentiment/confidence measures, economic surprise indices, earnings revision data, etc. tend to be mean reverting, and most of these readings have recently lost momentum. More aggressive posturing by the US administration on trade protectionism: While we remain uncertain on how pragmatic or not the administration will be in restructuring existing trade agreements and/or following through on the implementation of tariffs, we believe a higher probability of increased protectionism is unfolding. We believe protectionist trade policies would cause inflation expectations to stay elevated and could also result in a hit to demand/real growth (i.e., stagflation conditions). Recent indications that economic activity in China is slowing in response to the tightening of liquidity conditions and other actions by the government to reign in financial excesses/risk: While these actions have been pursued for several months, the impact to economic activity is just now starting to materialize and appears to be consistent with our expectation that China’s intent is to manage a gradual deceleration in its economy. Indications of “peak” policy, particularly on the monetary side: Globally, we see central banks gradually taking a more hawkish turn in removing emergency monetary accommodation and beginning the process of raising rates from ultra-low levels. While we believe the global economy is on firmer ground and credit and liquidity conditions remain quite accommodative, we acknowledge that we are coming from a challenging starting point in which financial markets benefited greatly from extreme monetary policies. Increased market volatility in response to rates rising: Our base case is that bond yields will continue to drift higher as a function of gradually higher inflation readings/expectations and the market’s expectations of additional monetary stimulus withdrawal on the part of central banks globally as economic conditions remain firm. Expectations that the administration’s unpredictability could lead to the US mid-term elections becoming more of a focal point for investors later this year: Given that much of what the current administration has accomplished from a deregulation standpoint has been through executive order, gains by the Democrats in mid-term elections could lead to investors shifting their focus to the possibility of the Democrats retaking the White House in 2020, in turn causing anxiety driven by the potential for the regulation pendulum to swing back. The market is still expensive: All of the above is taking place in an environment in which market sentiment and valuations remain stretched relative to history. We remain in a fairly stimulative environment: Negative real rate conditions continue to exist in many pockets of the world and global central bank balance sheets are still expanding in aggregate. Credit market conditions remain very healthy: While we are seeing some uptick in credit spreads and high-yield/investment grade CDS, we do not believe they are signaling any real signs of stress. Nominal global growth continues to churn higher: We believe the backdrop for companies to see further pricing power and positive earnings growth remains healthy. Employment markets remain robust, and wage growth continues to firm: We continue to believe global labor market conditions are supportive of stable consumption. Capital spending and business investment has picked up noticeably: Improvements in business confidence has resulted in the pick-up in private capex and business investment we expected to see. We believe capacity constraints in various industries’ supply chains, plus signs of labor skills shortages, will continue to provide tailwinds to the business investment component of GDP growth. In weighing the above factors, we have shifted to a more neutral outlook, where we now view risks to economic growth as becoming more balanced. Our base case is that the pace of growth plateaus near current levels, and we do not expect growth to downshift sharply. While activity momentum has likely peaked, our view is that the pace of growth can remain steady as there is no obvious imbalance in the drivers of end demand that need to be corrected. Our view is that earnings should continue to grow, albeit at a slower rate, and that central bank tightening is still in its earliest stages and expected to be very gradual. As can be gleaned from the above points, downside risks from our base case view lie primarily with a full-blown trade war developing, China slowing more than we expect, and those factors along with additional market volatility and/or political uncertainty leading to sharp drops in business and consumer confidence. Unless otherwise noted, figures shown are based in USD. Past performance does not guarantee future results. The Global Industry Classification Standard (GICS) was developed by and is the exclusive property and a service mark of MSCI Inc. (MSCI) and Standard & Poor’s, a division of The McGraw-Hill Companies, Inc. (S&P), and is licensed for use by Manning & Napier when referencing GICS sectors. Neither MSCI, S&P, nor any third party involved in making or compiling the GICS or any GICS classifications makes any express or implied warranties or representations with respect to such standard or classification, nor shall any such party have any liability therefrom. The MSCI ACWI Index is designed to measure large and mid-cap representation across 23 Developed Markets and 24 Emerging Markets countries. The Index returns do not reflect any fees or expenses. The Index is denominated in U.S. dollars. The Index returns are net of withholding taxes. They assume daily reinvestment of net dividends thus accounting for any applicable dividend taxation. 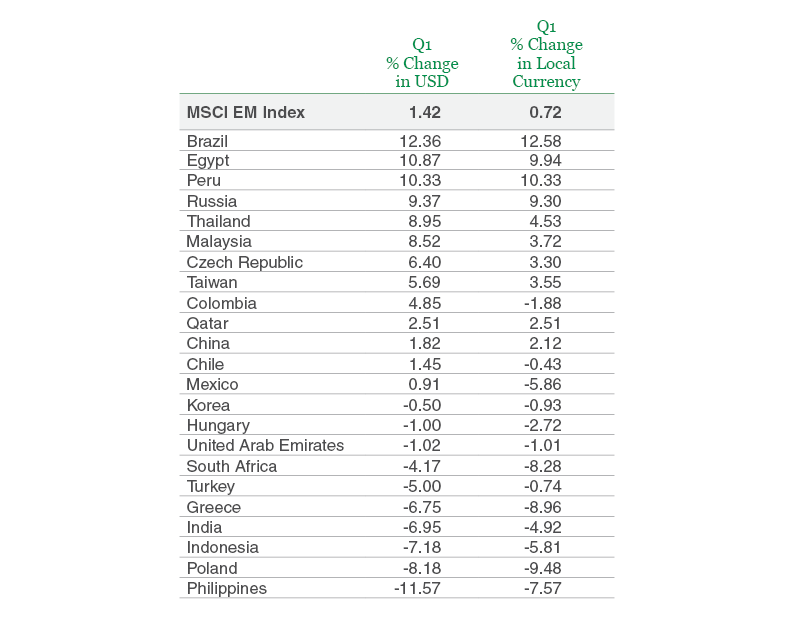 The MSCI Emerging Markets Index (MSCI EM) is a free float-adjusted market capitalization index designed to measure large and mid-cap representation across 24 Emerging Markets countries. The Index returns do not reflect any fees or expenses. The Index is denominated in U.S. dollars. The Index returns are net of withholding taxes. They assume daily reinvestment of net dividends thus accounting for any applicable dividend taxation. The Intercontinental Exchange Bank of America Merrill Lynch 10-15 Year U.S. Treasury (ICE BAML 10-15Y UST) Index is a subset of the ICE BofAML U.S. Treasury Index. The Index includes all U.S. dollar denominated sovereign debt publicly issued by the U.S. government in its domestic market with a remaining term to final maturity greater than or equal to ten years, but less than fifteen years. Qualifying securities must have at least 18 months to final maturity at issuance, a fixed coupon schedule, and a minimum amount outstanding of $1 billion. 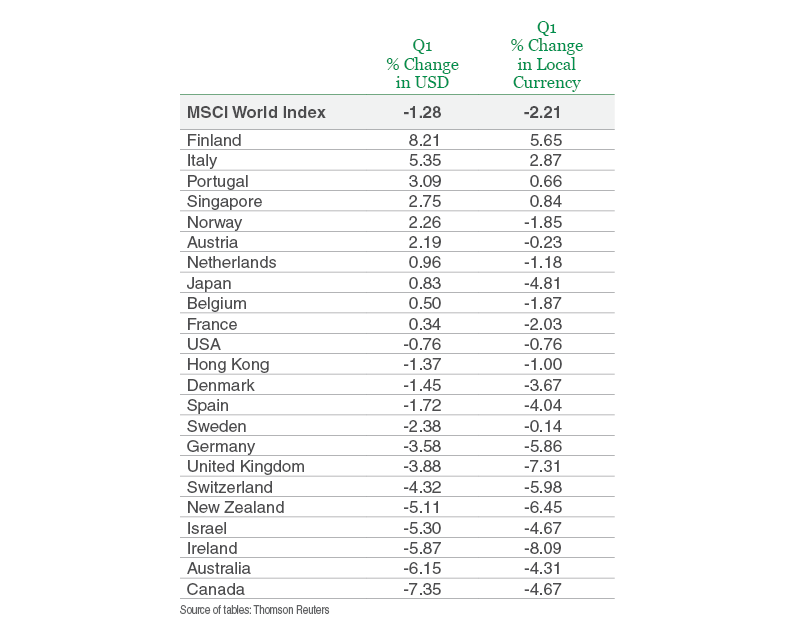 The MSCI World Index is a free float-adjusted market capitalization index designed to measure large and mid-cap representation across 23 Developed Markets countries. The Index returns do not reflect any fees or expenses. The Index is denominated in U.S. dollars. The Index returns are net of withholding taxes. They assume daily reinvestment of net dividends thus accounting for any applicable dividend taxation.